BEIJING — China's politically sensitive yuan sank to a 22-month low against the dollar on Thursday after the U.S. Treasury declined to label Beijing a currency manipulator amid a mounting tariff battle. The closely watched yuan fell to 6.9411 per dollar at mid-morning, coming its closest to breaking the symbolically significant level of seven to the greenback since December 2016. It recovered slightly in the afternoon. 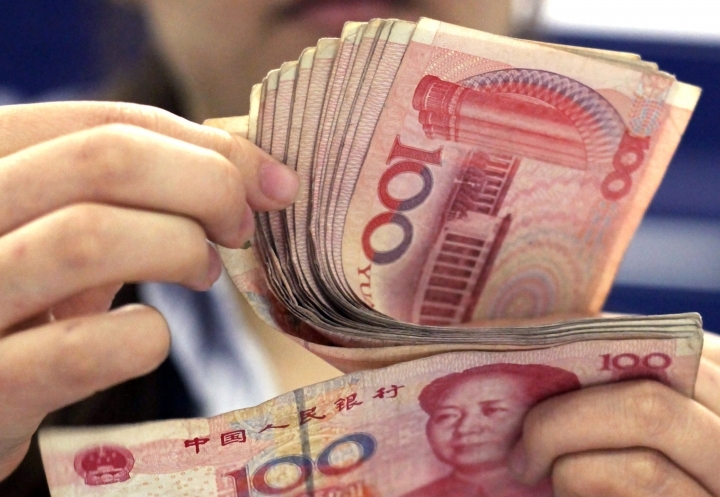 The yuan, also known as the renminbi, or "people's money," has declined by almost 10 percent against the dollar since April as China's economic growth cooled and U.S. and Chinese interest rates went in opposite directions. That helps Chinese exporters cope with tariffs of up to 25 percent imposed by U.S. President Donald Trump in a fight over Beijing's technology policy. But it raises the risk of inflaming American complaints about Beijing's trade tactics. Chinese officials have promised to avoid "competitive devaluation" to boost exports. Central bank governor Yi Gang repeated that pledge last weekend at a finance conference in Indonesia. But they have not said how far the yuan might be allowed to fall in response to market forces. On Wednesday, the U.S. Treasury's bi-annual report on currency policy said China failed to meet criteria to be labeled a currency manipulator, a status that can trigger sanctions. But it said Beijing was, along with Japan and Germany, on a list of governments whose currency polices would be closely monitored. China's foreign ministry welcomed the report and said it reflected "common sense and the consensus of the international community." "We hope the United States will respect the law of the market and basic facts and refrain from politicizing the currency issue," said a ministry spokesman, Lu Kang. The yuan's depreciation is "reasonable and explainable," said Zuo Xiaolei, a former chief economist for Galaxy Securities in Beijing. Zuo noted some other developing country currencies have declined by 20 percent or more in the same time. "If the renminbi had appreciated instead of depreciating this year, then China certainly would be a currency manipulator," Zuo said. While it helps exporters, a weaker yuan also might encourage an outflow of capital from the world's second-largest economy. That would raise borrowing costs at a time when communist leaders are trying to shore up cooling growth. The central bank has been trying to make its exchange rate mechanism more efficient by increasing the role of market forces. The People's Bank of China sets the exchange rate each morning and allows it to fluctuate by 2 percent against the dollar during the day in tightly controlled trading. The bank can intervene to buy or sell currency — or order Chinese banks to do so — to dampen price movements. Allowing it to fall too far "would run the risk that Trump would brand China a currency manipulator," said Diana Choyleva of Enodo Economics in a report. Beijing's "calculation on exchange rate policy is likely to change" if Trump and his Chinese counterpart, Xi Jinping, make no progress at a possible meeting during a November gathering of the Group of 20 major economies, said Julian Evans-Pritchard and Mark Williams of Capital Economics in a report. The central bank tried to discourage speculation by imposing a requirement in August for traders to post deposits for contracts to buy or sell yuan. That allows trading to continue but raises the cost.